January 28 (Bloomberg) Franklin Templeton's Michael Hasenstab, who made an outsize bet on Mongolian bonds, is feeling the chill after tumbling commodity prices and rising political instability spurred a plunge in notes issued by the frigid Asian nation. The $1.09 billion Asian Bond Fund, managed by a team including San Mateo, California-based Hasenstab, has declined 9.5 percent in the past year to lag behind 96 percent of its peers. Performance has been dragged down by junk-rated Mongolian notes maturing in 2022, which accounted for 7.24 percent of the fund's net assets as of Dec. 31 and was the largest single-credit bet, according to data published on Franklin's website. The 2022 notes slumped to record-low levels this month, as Mongolian officials plan meetings with global investors to discuss issuing more bonds. Mongolia represents the latest challenge to Franklin's contrarian bets on emerging markets, including commodity-rich nations that have been upended by a collapse in oil prices. Hasenstab, who leads Templeton Global Macro, is known for his investments on markets most bond investors shun, putting money in notes from nations including Ukraine, South Korea and Hungary. Franklin's $54.7 billion Templeton Global Bond Fund, co-managed by Hasenstab, lost 4.3 percent in 2015, its worst year since 1999, even as he dodged disaster by negotiating a $7 billion Ukraine debt restructuring. "The fund has a relatively high proportion of its assets in its 10 largest holdings," said Kean Chan, a research analyst at iFast Financial Pte, a Singapore-based fund rating and advisory firm, referring to the Asia fund. "It's not abnormal or bad per se, as it is a reflection of the managers' conviction and approach in managing the strategy." Franklin Templeton's Asian Bond Fund isn't alone in making big wagers. The $76.4 billion Franklin Income Fund, led by Ed Perks, had 11.2 percent of its money in oil and gas companies at the end of 2015, according to data compiled by Bloomberg. A year earlier, the stake was 16.3 percent. 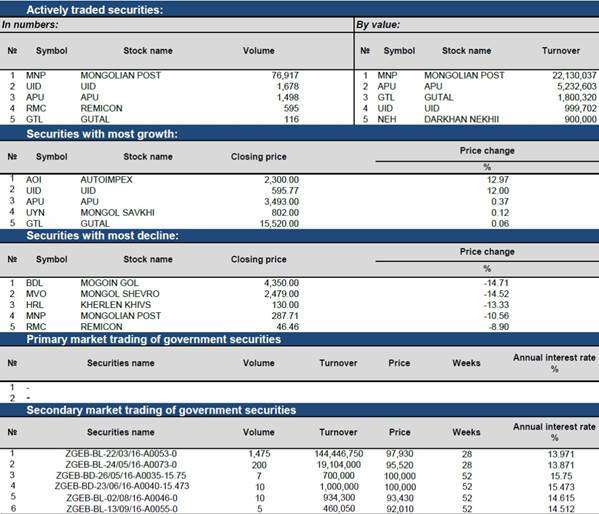 The Franklin Templeton Asian Bond Fund owned $98 million face value of the 2022 notes as of Dec. 31, according to data published on its website. That's down from $122.5 million, or 9.6 percent of assets, at the end of September, according to data compiled by Bloomberg. Mongolia's $1 billion of 5.125 percent 2022 notes slid as much as 5.5 cents this month to a record-low 74.1 cents on the dollar, pushing the yield to 10.52 percent, according to Bloomberg-compiled prices. The notes traded at 75 cents in Hong Kong on Thursday. The Asian coking-coal producing nation, plodding through a five-year market slump, mandated lenders to arrange meetings with global investors this month with a view of raising new funds. The meetings came against a dire backdrop; coal exports slumped 24 percent last year to $555.9 million as prices fell while receipts from copper shipments dropped 11 percent to $2.28 billion, government data show. The slide in coking-coal prices isn't a normal cyclical downturn but a fundamental shift that will place an unprecedented level of stress on the mining sector, Moody's Investors Service said on Jan. 22. While China's slowdown has stoked volatility, political risk at home is also escalating as Prime Minister Saikhanbileg Chimed faces a leadership challenge in parliament, tied to the development of Oyu Tolgoi copper mine. The Franklin Templeton bond fund handed investors a 1.5 percent loss this year through Jan. 25, following a 8.6 percent drop in 2015, as a slump in global markets deepened. 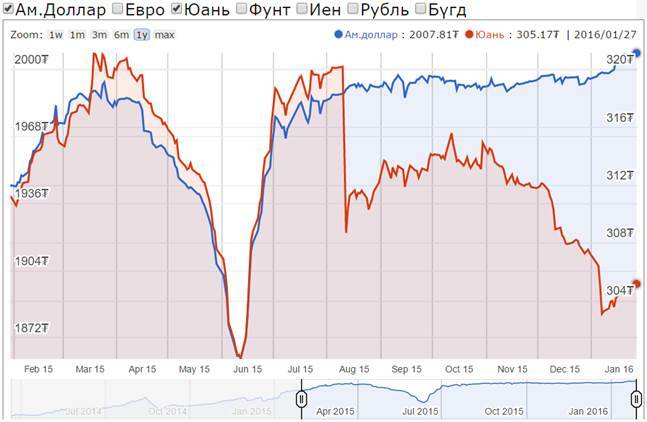 The Mongolian tugrik hit a record low 2,007.5 per U.S. dollar on Jan. 22, according to Bloomberg-compiled data. The price of coking coal futures has slumped 22 percent in the past year. Melissa Tan, a Templeton spokeswoman based in Singapore, said the Asian Bond Fund has no exposure to the tugrik. India, Indonesia, South Korea, the Philippines and China made up 70 percent of its asset allocation by geography, she said. Templeton declined to comment on whether the Asia fund would be willing to buy more Mongolian notes. "Mongolia risk is amplifying the negative impact from the commodities decline in unfortunate timing," said Dale Choi, the founder of research company Mongolian Metals & Mining in the capital city of Ulaanbaatar. "Further, Mongolia's leverage increased significantly, which increased vulnerability." January 26 (Bloomberg) -- Mongolian Mining Corp., a coking coal producer, hired advisers for a potential restructuring of $600 million of notes due in 2017 as the company struggles with declining coal prices amid oversupply and weakening demand from China's steel industry. The company hired JPMorgan Chase & Co. and SC Lowy Financial HK Ltd., and encouraged noteholders to form a committee to help discussions, it said in a filing to the Hong Kong Stock Exchange. The bonds dropped to 17.5 cents on the dollar Tuesday, their lowest on record. Steel output and demand in China, the biggest producer, is contracting as the world's second-largest economy grows at the slowest pace in a generation. The country plans to cut crude steel production capacity by 100 million tons to 150 million tons, the State Council said Sunday, without specifying a time frame. Coking coal futures have slumped 23 percent in Dalian in the past year, while the company has posted six straight semi-annual losses. "Changes to economic policy implemented within the group's principal target market, China, resulted in reduced crude steel production and consequently lower coking coal consumption and declining import volumes," the company said in its statement. Mongolian Mining is due to pay a $26.6 million coupon on March 29. If it fails to do so, it will be the fourth Asian coal company to default on its offshore debt obligations in the past year, according to data compiled by Bloomberg. Winsway Enterprises Holdings Ltd., Hidili Industry International Development Ltd. and PT Berau Coal Energy have all missed payments on their dollar notes in the past 12 months. 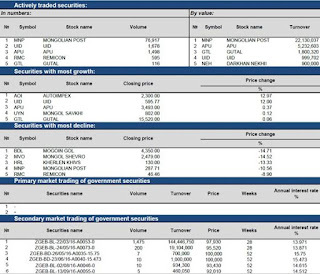 January 27 (AAStocks) MONGOL MINING (00975.HK) (-0.067 (-56.78%)) said during last few years, the coking coal markets experienced continuing price decline amid the oversupply situation experienced by the global industry. Furthermore, changes to economic policy implemented in the PRC resulted in reduced crude steel production and consequently lower coking coal consumption and declining import volumes. The company is seeking a potential restructuring of the US$600 million 8.875% senior notes due 2017 issued by the company. The company encourages the holders of the notes to form a committee of the Holders for the purposes of facilitating discussion about such potential restructuring of the notes. The share tumbled to $0.058 today (27 January), hitting a new low since its listing. It last traded at $0.06, plunging 49%, on volume upsurging to 184 million shares, which was quite rare in past 1.5 years. · Mongolian coal miner Mongolian Mining Corp. announced that it is seeking a potential restructuring of its senior unsecured notes due 2017. · In light of persisting tough operating conditions and mounting debt maturities, we believe the restructuring could include an exchange that we would consider distressed. · We are therefore lowering our corporate credit rating on MMC to 'CCC-' from 'CCC'. We are also lowering our issue rating on the company's senior notes to 'CCC-' from 'CCC'. · The outlook is negative, reflecting the likelihood that the company may pursue a capital restructuring or debt exchange that we would view as distressed. SINGAPORE (Standard & Poor's) Jan. 27, 2016--Standard & Poor's Ratings Services today lowered its corporate credit rating on Mongolian coal miner Mongolian Mining Corp. (MMC) to 'CCC-' from 'CCC'. At the same time, we lowered our issue rating on the company's US$600 million senior unsecured notes to 'CCC-' from 'CCC'. The downgrade follows MMC's announcement that it has hired advisors to provide advice on the potential restructuring of the company's outstanding notes. We believe any transaction or debt exchange would likely be substantially below par value, given that the company's unsecured notes currently trade below 30 cents on the dollar. As per our criteria, we would view an exchange as distressed if, in our view, the offer implies that the investor will receive less value than the original securities promised; and is distressed rather than purely opportunistic. "We believe a default is likely within the next six months barring an agreement with the company's creditors on a restructuring," said Standard & Poor's credit analyst Xavier Jean. "This is because MMC needs to repay more than US$150 million in debt amortization and interests in 2016. The company's US$600 million notes also mature in 2017. This compares with our estimate of cash balance below US$50 million as of Dec. 31, 2015." MMC has been cutting operating costs substantially over the past 12 months to stabilize its operating performance. Although the company could break-even on an EBITDA basis in 2016, it still faces a substantial interest servicing burden and rapid cash depletion. The outlook is negative, reflecting the likelihood that the company may pursue a capital restructuring or debt exchange that we would view as distressed. "We will lower the rating if MMC announced a capital restructuring that we view as a distressed exchange. We will also lower the rating if restructuring discussions with bondholders take time and the company misses a payment on interest or debt due in the meantime," Mr. Jean said. Although unlikely, we could raise the rating if we no longer believed a capital restructuring or debt exchange was likely over the next year and the likelihood of a default has reduced. A rating upgrade would be contingent upon MMC's liquidity having strengthened substantially with a reduced risk of a default beyond the next 12 months. This could happen if the company raises sufficient cash to match its short-term debt and interest repayment obligations. January 26 (BNN) Turquoise Hill Resources has raised a critical round of financing worth $4.4B to advance underground development of its Oyu Tolgoi copper and gold mine in Mongolia. A look at the next steps, as well as the political climate in the nation, with Jeffery Tygesen, Chief Executive Officer, Turquoise Hill Resources. Rio Tinto's massive gambit in Mongolia comes at an inauspicious time for commodities, but may be the country's only way forward. January 25 (The Political Analysis) Since the fall of communism, Mongolia has been transformed from a backwater of Marxism-Leninism into a superstar of the steppe. In popular imagination it is a land of herders and tribesmen on endless undulating wastes, but in reality the country sits on some of the greatest reserves of metals in the world. Fueled by the Chinese economic engine to the south, the country has embarked on a number of resource-extraction projects, the grandest of which is the government's joint venture with Rio Tinto: the Oyu Tolgoi mine. In December of last year, a financing deal was finally put in place to begin Phase II of the project, which will catapult the mine to the top of the tables in resource output. All of this comes against the backdrop of a collapse in commodities prices, however, leading some to question the wisdom of the Mongolian government's commitment to the project. Oyu Tolgoi was the gem in the government's crown, and until 2012 the country posted envious economic growth rates, culminating in nearly 18% growth in 2011. Following this high-water mark, the global commodities markets began their precipitous decline from unprecedented highs. China and other industrial nations across the Global South began to see a slowdown driven by low consumption all over the world. Declining demand for resources, combined with a glut following a decade of ever-larger mega-mines, resulted in the price of nearly every raw commodity plummeting back down to Earth. Rio Tinto, previously flush with cash, found itself hemorrhaging cash and capital, and in 2013 made the decision to halt development on Oyu Tolgoi. The economic reality of the situation has not been helped by the political turbulence in Mongolia. After a decade of Democratic Party rule and rapid industrialization, the country has seethed and cracked as large swathes of the populace feel underserved by rapid growth. The current Prime Minister came to power after the Democratic Party's minority in the Parliament was unable to overcome a vote of no-confidence. Popular resentment is fueled by the failure of the government to both secure further investment and to ensure a more equitable distribution of mining profits both into its own coffers and to the people at large. In spite of the challenging commodities market and China's worsening economic situation, Oyu Tolgoi remains profitable—its output is so great, and the cost of closing it so high, that to do anything other than produce and expand would be a great expense to the already battered investors. Rio Tinto's recent financing deal will allow for the mine to expand production and will be, by far and away, the largest single contributor to the country's overall ﻿GDP﻿ and the main driver of growth for the foreseeable future. Two major risks remain for the project. The first is that China's economic slowdown will manifest as an all-out crash. 2016 started off on a bad foot for Chinese stocks, leading many to think the country might be on the verge of a major economic catastrophe, but in all likelihood these market jitters do not accurately represent the state of the Chinese malaise. While the country is likely to continue to continue its slowdown, traders on the Chinese market are generally smaller and less sophisticated than their Western counterparts—more susceptible to panic and groupthink, resulting in a divergence between reality and stock trading. Thus, while the indicators coming out of China, including its almost certainly government-inflated GDP growth numbers, are not encouraging for the future, it is important to keep Chinese stock jitters separate from concrete economic analysis. January 26 (BoM) On the Foreign Exchange Auction held on January 26th, 2016 the BOM has received buying bid offers of USD 38.5 million in a rate between MNT 2002.82-2009.90 and bid offers of CNY 13.9 million in a rate between MNT 304.0-304.56 respectively. 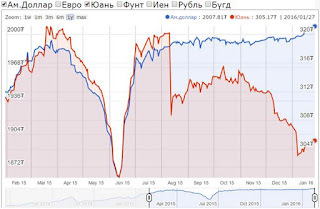 The BOM sold USD 14.0 million in a rate of MNT 2007.90 and CNY 4.9 million in a rate of MNT 304.20. On January 26th, 2016, the BOM has received MNT Swap agreement buying bid offers equivalent to USD 5.45 million and USD swap agreement selling bid offers of USD 10.0 million from local commercial banks and the BOM accepted the MNT swap agreement buying bid offers of USD 5.45 million. January 27 (BoM) Auction for 28 weeks maturity Government Treasury bill was announced at face value of 25.0 billion MNT and each unit was worth 1 million MNT. Face value of 15.3 billion /out of 15.3 billion bid/ Government Treasury bill was sold at discounted price and with weighted average yield of 14.108%. January 27 (UB Post) The following is an interview with Mining Minister R.Jigjid about gold mining and Gatsuurt. Talks on issuing loans to gold mining companies started two years ago, but no progress has been made so far. Gold miners are still waiting. When will the government address this issue? The government made a decision during the latter part of last year. Gold mining operations stop during winter and resume in spring. We are making preparations to resume operations smoothly. The Ministry of Mining has received the plans from mining companies for operations for this year. We have assessed how much each company extracted last year and their future plans, and have selected companies that are eligible for support and submitted their names to Mongol Bank. We need 256 billion MNT for this. This will be issued by commercial banks through the Central Bank. This can be understood as an issue that has to be discussed by Mongol Bank, commercial banks, and businesses. Since this is a risky business, the collateral will have to be agreed on through a discussion with businesses. We are currently at the discussion stage of this endeavor. How many companies are eligible for government financial support? Is the list finalized? What will the interest rate of the loan be? In the initial stage, we have selected almost 50 companies. We will shortlist them even further. Mongol Bank and commercial banks will make the final decision. We can assess their performance this year and decide on additional financial support. Gold collection at Mongol Bank has increased in the last few years. How much gold was mined last year? Will gold prices rise? What are the prospects? Mongolia has been carrying out the Gold Program over the last two years. In 2014, 13 tons of gold was extracted, which was a 2.6 fold increase from the previous year. Almost 15 tons of gold was extracted in 2015. The program is yielding results. To achieve this result, the tax environment was the major driver. For instance, mining royalties are set at five percent, but if gold miners sell their gold to Mongol Bank, their royalties are reduced to 2.5 percent. Price-based royalties have been set at zero. Through this measure, we were able to reduce the amount of gold from the black market and tax evasion, and gold collection at Mongol Bank has increased. The gold collected from individuals has also increased. Around 40 to 50 percent of the gold sold to Mongol Bank is from individuals, according to latest statistics. Gold prices are relatively stable at the moment. Parliament is split on the amount of shares the state should own from Gatsuurt mine. What was the agreement with the outside investors? Independent Parliament members said that the state should own 34 percent, or the amount of tax charged from the mine should become a fee instead. According to the law, the state is entitled to own up to 50 percent of a mine if the exploration work for the mine was financed by the state, and 34 percent if exploration was privately funded. But that means that the state will need to invest 34 percent of a mine's financing. This is a difficult choice to make during an economic decline. To invest the necessary funds, we will have to borrow. This will mean we will have to repay a loan and, at the same time, keep operations profitable in order to gain dividends. In other words, it will require time. Due to this factor, we have set a royalty of five percent, regardless of the size of a mine, to avoid the issues we faced with foreign investors in strategic mining projects in the past. If gold prices are at 1,300 USD per ounce, the tax rate at Gatsuurt will be three percent. To clarify this again, the amount of tax will be determined based on the price of gold. If this mechanism is implemented, special payments will be made to the state after a sales order is completed. In other words, instead of getting dividends many years after a successful operation, Mongolia will receive a three percent share every time a sale is made, regardless of whether the company is operating efficiently or not. For this mine, there are three types of special payments. This means that the Mongolian government can receive up to 13 percent in taxes. How much money will the tax amount to? The government will receive 432.3 billion MNT from the mine's total sales. When we made these estimations, we accounted gold prices to be at 1,300 USD per ounce. Mongolia can pay off the amount of investment needed for its share within 5.2 years. From the total cash flow, the Mongolian government will receive around 68 to 70 percent of a mine's output. January 27 (news.mn) The Mongolian People's Party (MPP) Group and non-party Members of Parliament have announced that they accepted the proposal to dismiss the Prime Minister. We have, therefore, asked what the views of several members of the Democratic Party (DP), as to what they think. B.Garamgaibaatar, MP and head of DP the Group in Parliament. -The MPP has stated that they want the PM to be dismissed. Can the position of the opposition party effect the Government? -The decision of MPP was made on Monday – it doesn't come as a surprise. On Monday, it became apparent that even though the project to dismiss the PM was presented by G.Uyanga, the MPP was behind it. As the DP, we are working to ensure that our Government does not fall. We are certain, therefore, that the Government will not fall under any circumstances. - The MPP called a boycott on the debate regarding counting votes manually in elections. On that occasion the DP could not raise the necessary quorum for debate. If the MPP calls a boycott again because of the Government dismissal issue, will the DP be able to ensure that sufficient members are in attendance for a Parliamentary session? - We will try to ensure that the 35 MPs of DP will attend the session. The 26 MPs of MPP, three MPs of Justice Union and non-party MPs cannot dismiss the Government, even if they all stand together. J.Batzandan. MP, Chairman of Application Standing Committee. - Parliament will discuss the proposal to dismiss the Government this week. In your opinion, what will the outcome be? - The Government will not be dismissed. The issue will be discussed, but the Government will not be dismissed - it is clear to see. -There are quite a lot of MP's who want it to be dismissed. Will they influence the decision? - The MPP is the opposition party. Their aim must be to control the party in power. But, all they are doing is making protests, calling for dismissals. We need creative opposition party, not them! The MPP is not able to work as an opposition party should. I want to say: "Learn how to do these jobs – in the correct way". They used to run Mongolia, when they were in power. As the Opposition they are still creating obstacles; they should stop doing this. I want to say - stop making political performances like this. January 27 (gogo.mn) Saga on disputes and litigation on lowering the interest rate of mortgages into 5 percent continues. This issue was discussed today at the Economy Standing Committee. MP A.Tleihan questioned President of BoM N.Zoljargal on Z.Bayanselenge's, Minister of Construction and Urban Development, official announcement on lowering the mortgage interest rate to 5 percent and in reality, banks are issuing mortgages with 8 percent interest rate, which creates expectations among the public and asked to give definite answer. In response, the President of BoM N.Zoljargal said that lowering the mortgage interest rate to 5 percent will be finalized within March and preparatory work has begun already. Regulation on Mortgage Lending Process is needed to be amended in order to lower the interest rate and BoM is working and meeting with the Ministry of Construction and Urban Development regularly. Due to Future Heritage Law approval, some arrangements should be made in accordance with the law. Ulaanbaatar, January 27 (MONTSAME) The Minister of Mining R.Jigjid presented Wednesday draft amendments to the Law on Nuclear Energy and the Law on Mineral Resources to the Speaker Z.Enkhbold. Mr Jigjid considered legal grounds must be set concerning royalties imposed on operations at radioactive mineral deposits. State Policy on Radioactive Mineral Resources and Nuclear Energy (parliamentary resolution No 45), issued in June 25 of 2009, regulates that designation of state ownership in operations of radioactive mineral deposits is to be similar to that of strategically important deposits. The state policy also outlines that the regulations should be in line with the international standards regarding the utilization of nuclear energy for peacetime purposes, operational safety, protection, responsibility and accountability. The Law on Mineral Resources reflects in a certain level some regulations concerning imposing of royalties in cases when the state ownership is transferred to executing companies. The Law on Nuclear Energy is deficient in regulations of such circumstances, said the Minister. Cabinet Secretary proposes delaying effective date of "law on laws"
Ulaanbaatar, January 27 (MONTSAME) The law on legal documents, adopted in May 29 of 2015, is supposed to take effect this February 1. A head of Cabinet Secretariat S.Bayartsogt submitted Wednesday a draft amendment to this law proposing to postpone the date of the effect until January 1 of 2017. "It will take some time to organize trainings and meetings to disseminate the knowledge about this new law, and the methodologies reflected in the 12th chapter should be properly developed", said S.Bayartsogt. The law on legal documents manages the relations regarding initiation of parliamentary and other level decisions, preparing, assessing and discussing their drafts, submitting them to parliament, publishing, informing about and managing implementations of adopted documents, as well as monitoring and evaluations. With the law implementation, it is expected that the quality of document preparations would improve and a favorable environment for practicing laws would be created. January 27 (gogo.mn) 1. Budget Standing Committee meeting at 9am. 2. Economic Standing Committee meeting at 9am. 3. Social policy, education, culture and science standing committee meeting at 11 am. 4. Justice Standing Committee meeting at 2 pm. 5. State Structure Standing Committee meeting at 2pm. 6. Environment, Food and Agriculture Standing Committee meeting at 4pm. January 27 (UB Post) Former Deputy Minister of Finance S.Purev has been working as acting head of the recently integrated General Customs and Taxation Office. He gave an interview explaining why the two organizations had to integrate and how it will impact Mongolia. Some people criticized that merging the General Customs Office with the General Department of Taxation is a "policy mistake". Why were these two organizations integrated? These two organizations have been operating separately for many years. There are various reasons for the integration of the General Customs Office and General Department of Taxation. Mongolia has been carrying out large economic reforms and changes lately. The first step to recover the Mongolian economy and ensure transparency is to maintain a consistent registration control system. The state renewed the Value-added Tax Law to register and control all sales of products in Mongolia. We've been running with one hell of a cycle, in which tax departments chased after businesses that continuously concealed their documents. Authorities realized that the system was defective and decided it was best to study international standards and have the public participate in operations. The law was amended to improve registration and accounting together with the public. The public pays two different types of taxes. First is the 10 percent income tax and the other is the 10 percent sales tax that people pay when purchasing goods. The public pays 10 percent of tax in the form of VAT. VAT is a more developed and refined form of a sales tax. Over 120 countries charge sales taxes through VAT. Each organization used to deduct taxes and control tax payments before, but now, individuals can register their receipts online and notify that they paid sales taxes. The new system is a way to prevent fraud. Using the new system is the same as saying that you want the tax you paid to be used better, such as for improving kindergartens and schools. In this sense, I hope that everyone cooperates and registers their receipts from procurement and services. We will not ignore peoples' efforts. In a way, we're having people work and monitor the taxation system. This means that Mongolia's three million people have become tax inspectors. We used to have 1,800 tax inspectors, but now, they've increased to three million tax inspectors. It's only right to reward and provide salary to our three million inspectors. The state will refund two percent of the original 10 percent tax they paid. I'm only speaking about the basics. Cooperating like this is mutually beneficial to the state and public. First of all, individuals will fulfill their role to register their bills. Secondly, this will help families account their household income and expenses. Your purchases are categorized on the website ebarim.mn, so it will be easy to analyze how much you spend on utility, food and other expenses. The website is very useful for entities as well. Accountants and even directors have a hard time if a company keeps concealing things. This situation has been ongoing for years and years. Assets worth 9.1 trillion MNT was revealed through the Transparency Law. Lawmakers initially planned to make seven to eight trillion MNT transparent, right? That's exactly what we're trying to do – make assets transparent. It's wrong to keep things hidden. We're living in the 21st century. The nation should develop. Whether the state is able of collecting taxes or not is an important indicator of state's capacity and competence. The Mongolian government ranks quite low if we look at it from this side. The underground economy makes up 40 percent of the entire economy. Around 60 percent of the 9.1 trillion MNT that has become transparent is VAT. In other words, taxes paid by the public weren't deposited to the state budget. We have to work together with the public. It would've been impossible to make this much money transparent even if we had doubled the number of national tax inspectors. The underlying outcome of joining hands with the public is extremely significant for creating a healthy society. It was necessary to improve the structure to implement the new systematic change. Accounting and database are gradually becoming one. Every operation, starting from the first customs tax payment until the final sale, has been put under an integrated control so an integrated organization must register and account everything. Therefore, the General Customs and Taxation Office was established for this reason. Does that mean receipts will contribute greatly on the control mechanism of tax payments? Let me tell you an example. A fellow imported 100 car wheels, but sold 200 wheels. This happened because the number was misreported at the customs. The fellow imported 200 wheels but negotiated with a customs officer and had only half of his goods registered. This isn't a secret. However, the public will reveal that the fellow had actually sold 200 wheels by registering their receipts. Customs is a large organization that contributes greatly to the state budget revenue. Most people believe that the Customs Office is solely related to money. This isn't true. In fact, it plays a major role in maintaining national security. Customs are responsible of not letting goods of national value out of the country and not letting bad things into the country. Customs officers can now concentrate on doing their real job since the Tax Office will take care of issues related to revenue. Did the General Customs Office and the General Department of Taxation have separate databases? They didn't have an integrated database and used to make decisions separately. They will operate as a single organization and make decisions together based on an integrated database from now on. Most recently, Portugal integrated its customs and taxation offices. So did Poland and Slovakia. This has become a global trend. What kind of structure will the General Customs and Taxation Office have? Will the structural change apply only at administrative level? Yes, the change will apply to the administrative level only. Once an integrated database is made, decisions will be issued and all operations will be regulated accordingly. All border points are working normally and so are tax departments. As the two organizations are being united, we will decrease the number of employees to some extent. Is it true that around 120 people will be laid off? Around 120 people will be laid off from customs and taxation departments. This will pertain to those who are on leave due to poor health and those retiring. Around a hundred people will be laid off from each level if we consider all the posts that will overlap as the two departments join together. How many civil servants work at customs and taxation departments? In total, approximately 3,200 people are working at customs and taxation departments. Mongolian businesses and organizations have to report their revenue according to the law. Yet, they have to be inspected every two years, meaning that the two sides don't trust one another. The General Department of Taxation has to inspect because there isn't an integrated database. Lack of information is causing mistrust. There will be no need for an additional inspection every two years if the database is developed and improved. We could prolong the regular inspection by five to 10 years if submitted reports and information are always truthful. Are residents outside of the capital registering their receipts? Have special receipts with QR codes been distributed to soums and smaller administrative units? Radios and televisions are promoting and reminding people to take their receipts. Every tax department is taking various measures to promote, raise awareness, and help the public understand the new Law on VAT. The law became effective on January 1, 2016. Some entities failed to make necessary preparations. This is understandable. The law specified that businesses must have a printing machine or a similar equipment, and are obliged to give out receipts to customers. Every customer has the right to demand a receipt for their purchase or service. Increasing awareness and regulation of the law's enforcement have become the main focuses of tax departments. Provincial tax departments are organizing trainings and workshops in their local areas. Things should stabilize soon. We're taking many technical measures so shops and stores just need to get a printing machine. It doesn't have to be a cash machine. The software has been distributed for free. Any organization can visit ebarimt.mn and download the software. They have to connect their printing machine with our system through the internet and send their information within three days. I've signed an agreement with G-Mobile Company, enabling G-Mobile users to send their QR codes via mobile for free. Other cellular network companies have also proposed to cooperate in this manner. Businesses and customers are all very interested in this and are participating actively. Some observers say that issues related to cash machines should have been regulated before the law became effective. Others are uncertain if it is necessary to demand a receipt for purchasing a loaf of bread. Can you comment on this? In the past, customers used to get a receipt for purchasing a loaf of bread. We're not making up new things. All we did was include tax details to the things we used to do before. It's wrong to cause damage or loss to the public. Receipts must be handed to every customer no matter where or what they purchase. People shouldn't criticize because this is what's written in the law. Even if there isn't VAT or a lottery, customers' rights should be protected and receipts should be given to them. Now that receipts have become relevant to taxes, people are starting to say all sorts of things. The General Customs and Taxation Office will put strict requirements to enforce the law. Ulaanbaatar, January 27 (MONTSAME) A member of parliament Kh.Temjuujin Wednesday submitted to parliament draft amendments to the laws on criminal procedure, on adjudication of administrative cases and a bill on annulling some articles of the law on adjudication of civil cases. He worked out these drafts due to annulments of some clauses of the law on court and with a purpose of harmonizing them with the law on court, he explained. Supreme Court of Mongolia delivered the list of registered political parties to the General Election Commission of Mongolia. According to the Election Law of Mongolia, political parties must register in the Supreme Court of Mongolia at least 180 days prior to the polling day and then they will have right to nominate in Parliamentary election. We deliver you the list of political parties registered in the Supreme Court of Mongolia. On 21st Oct, 2005 changed its name to the Motherland Party. 2005.01.20-ны өдрийн 01 дүгээр тогтоолоор бүртгүүлсэн. January 27 (news.mn) The 46th session of the Democratic Party (DP) National Consultative Committee, which was planned for the 20th January, has been postponed for an unspecified period. The acting secretary of the DP L.Erkhembayar explained the reason: "the issue of the dismissal of the Government is more important than the National Consultative Committee". Perhaps the real reason why it did not take place is the rumor that approximately 70 of the all 228 members turned up for the session. According to the DP, the next National Consultative Committee session will take place in March 2016; this will be during the spring recess of Parliament. Ulaanbaatar, January 27 (MONTSAME) The Transparency International Wednesday released the 2015 Corruption Perceptions Index of countries. According to it, Mongolia was ranked the 72nd among 168 countries, going up by eight places against the 2014 index. Mongolia was 80th among 175 countries in 2014, 83rd in 2013, 94th in 2012. The Transparency International said the 2015 results showed that people working together can succeed in the battle against corruption. Although corruption is still rife globally, more countries improved their scores in the 2015 edition of Transparency International's Corruption Perceptions Index than declined. Overall, two-thirds of the 168 countries on the 2015 index scored below 50, on a scale from 0 (perceived to be highly corrupt) to 100 (perceived to be very clean). Yet in places like Guatemala, Sri Lanka and Ghana, citizen activists in groups and on their own worked hard to drive out the corrupt, sending a strong message that should encourage others to take decisive action in 2016. Top performers share key characteristics: high levels of press freedom; access to budget information so the public knows where money comes from and how it is spent; high levels of integrity among people in power; and judiciaries that don't differentiate between rich and poor, and that are truly independent from other parts of government. The Corruption Perceptions Index is based on expert opinions of public sector corruption. Countries' scores can be helped by open government where the public can hold leaders to account, while a poor score is a sign of prevalent bribery, lack of punishment for corruption and public institutions that do not respond to citizens' needs. January 27 (Freedom House) Economic downturns and fear of social unrest have led Russia, China, and other authoritarian regimes to crack down harder on dissent, while mass migration and new forms of terrorism in 2015 fueled xenophobic sentiment in major democracies, according to Freedom in the World 2016, Freedom House's annual report on political rights and civil liberties. January 27 (gogo.mn) NRGI, CCSI, UN SDSN and the World Bank are launching a new course, Natural Resources for Sustainable Development—a major step forward for global learning about the governance of extractive industries. This MOOC—massive open online course is free, meaning that anyone with an internet connection can benefit from instruction by some of the world's foremost experts in this critical topic. Prof. Jeffrey Sachs, Prof. Sir Paul Collier, NRGI's Daniel Kaufmann and more than a dozen other thought leaders will take learners through an exploration of key issues like the political economy of natural resources, legal dimensions of extraction, environmental challenges, and the management and investment of revenues for sustainable development. This course is aimed at those who seek to build a solid and comprehensive understanding of this critical field. The course commences 1 February 2016, and lasts 12 weeks, but new learners can register and begin the course after that date, catching up at their own pace. January 27 (UB Post) Mongolia's first triple-play telecommunications service provider, Univision, has received harsh criticism from its hundreds of thousands of subscribers after announcing that it would restrict internet usage starting from February 1, 2016. A group of subscriber representatives held a press conference on Monday to express their discontent with Univision's service and change in policy, and said that Univision customers would be investigating the legality of the matter. Univision was launched in 2011 by Unitel Group as the first Mongolian triple-play service, offering internet protocol (IP) television, Voice over IP telephone services, and broadband internet access. The company attracted hundreds of thousands of customers by promoting the provision of HBO Signature, HBO Family, HBO Hits, and HBO HD channels on top of Mongolian channels available and unlimited internet usage. Univision currently broadcasts only HBO HD and has now announced that internet usage will be limited to improve speed, charging subscribers for services not provided as advertised. Originally, Univision offered a package that offered television services and unlimited internet with a speed of one Megabit per second (Mbps) for 29,900 MNT a month. Univision's recent decision restricts users to monthly access to 200 GB of data with a speed of three Mbps for 39,900 MNT, 300 GB for 54,900 MNT, and 500 GB for 89,900 MNT starting next month. Representatives of Univision subscribers believe that this sudden change is a violation of their contract with Univision. They stated that they signed up for Univision in the first place because it offered unlimited internet usage. In response to this complaint, Univision states that the company can make changes to contracted service fees in accordance with Section 8.2 in the contract signed by subscribers. The contract states that this type of change is possible provided that notice has been provided at least 10 days in advance. Attorney O.Badkhuu stated during the press conference that Univision's contract doesn't meet legal criteria. "Univision announced that it would limit internet usage based on Section 8.2 in the contract. This will create a very poor standard in the future. If Univision is able to limit internet usage without listening to the opinions of its users, it can even terminate all channels ten days after an announcement. This law wouldn't be considered legal if we submitted it to a court," he said. The representatives asked the Communications Regulatory Commission (CRC) and Authority for Fair Competition and Consumer Protection to hold Univision accountable. When speaking about the matter, a representative from the CRC explained that the commission doesn't have the authority to get directly involved in issues related to prices and tariffs for Univision or other cable television providers. The CRC is only able to control the tariffs of monopoly companies. Although Univision users say that the operator is taking advantage of a monopoly status, Univision doesn't dominate the market or have monopoly status. "A company has to determine tariffs based on its investment. For example, it should take account of how much capital it spends to provide equipment (modems) and internet traffic from abroad. The CRC merely provides pricing methodology," stated A.Luvsan-Ochir, head of the Market and Tariff Department at the CRC. The CRC hasn't started reviewing complaints from Univision users at the moment. Two complaints reported to the 11-11 Center for comprehensive inquiries and public complaints have been transferred to the Authority for Fair Competition and Consumer Protection. Univision users put a lot of faith in these two organizations, but neither of them have given a favorable response. One declined to intervene in the issue, saying that it was out of their reach, and the Authority for Fair Competition and Consumer Protection said that this type of complaint is frequently reported and that the authority is checking into the matter as part of its regular inspections. One of the organizers of the press conference stated that he had received a positive reply from the former Head of the CRC, T.Ayurs, when he spoke to him about the issue two months ago. T.Ayurs was going to discuss this issue with representatives from Univision, but the case fell to the wayside with administrative changes at the CRC. The new Head of the CRC, D.Munkhtur, will need to pay attention to this matter if he wants to fulfill his role and protect the rights of thousands of consumers. Many people have debated about Univision's new decision on social media. One side supports the decision in consideration of Mongolia's low prices for internet access compared to other countries. The opposing side points out that countries that charge higher fees have higher standards of living and provide higher salaries. D.Enkhbat, the CEO of Datakom Company, which first introduced internet services to Mongolia in 1994, tweeted that he was against Univision's decision. He wrote that limiting internet usage is toxic, as it goes against the basic principles of the internet. During the press conference, Director of the Board of Mongolian TOP 8 Club N.Batzorig and sports commentator B.Amarsaikhan stated that Univision has been providing poor services lately. N.Batzorig gave the example of SPS sports channel, which reportedly lags frequently. He said that the only explanation he gets from Univision operators is that the company is experiencing technical errors, but the problem hasn't been resolved for nearly two months. Deputy Director General of Univision D.Jamiyansharav, who is in charge of Business Development and Planning, was asked about Univision's decision to limit internet usage. He said, "Univision isn't limiting users' internet usage at all. All we're trying to do is regulate internet speed when a user's data usage reaches a certain level. This doesn't mean that their internet accessibility will be closed." When asked if the amount of internet access is sufficient, S.Jamiyansharav said that the company considers it sufficient. He added that a study conducted by Univision shows that 99 percent of Univision users use 49.2 GB a month. As the smallest package offers 100 GB, S.Jamiyansharav believes it's more than sufficient and advised households with higher internet usage to sign up for M, L or XL packages. Univision receives many complaints related to the speed of their internet. In regards to this, S.Jamiyansharav stated that the company isn't responsible for slow internet, as it depends on many factors, such as the number of people using the internet simultaneously, distance from Wi-Fi modems, the workload of the server, and content being downloaded. Since people have already signed contracts with Univision and are displeased with Univision's services, it's only right to cancel their contracts. However, this isn't as easy as it sounds, because Univision users will face significant penalties. To receive Univision services, subscribers pay installation fees for television and internet cables and purchase modems. All of this costs some 60,000 MNT. These cables can't be reused for other service providers, meaning that people will have to pay additional fees to install and connect to different operators. If a Univision subscriber decides to cancel their contract, he or she will need to speak with Univision directly. The customer can receive assistance from the Mongolian Consumer's Rights Society and follow legal channels if they aren't able to settle the issue or reach a negotiation with Univision, according to A.Luvsan-Ochir at the CRC. Ulaanbaatar, January 27 (MONTSAME) Draft amendments to the Law on Mineral Resources was presented Wednesday by the Minister of Industry D.Erdenebat to the Chairman of State Great Khural (parliament). The Minister said the government "should promote mineral processing operations on non-balance ore and waste dumps, created by years of mining operations at mineral deposits". As of today, more than 600 deposits have been discovered, of which 200 are being operated, he went on. From the open pit operations of Erdenet Mining Corporation, as well as other coal and gold mines, enormous waste dumps have been formed. These dumps, depending on the technological performances, turn into unnaturally occurred mineral deposits. "Therefore, these so-called tailings and waste dumps need to be operated in order for the contained minerals and ores to be extracted and used in production of metal products, as the global market metal prices increase", he said. "So the draft suggests reflecting clarified regulations on mineral extractions from mine waste dumps and tailings, improving metal recovery, commercializing value-added products, and on imposing royalty on final products," he explained. To prepare the amendments, a team had studied practices of other countries in processing secondary mineral resources, for instance, the processing plants in Canada recover 40 percent out of the total copper in 0.45% content waster dumps, he said. With the procession of waste dumps, mineral resource utilization and economic efficiency are bound to improve, as it prevents certain costs for additional explorations. "If adopted, it is expected to raise state budget revenue and processing industry income and performance, create new jobs, and, most importantly, to contribute to environmental rehabilitation," he stressed. Ulaanbaatar, January 27 (MONTSAME) At its meeting on Wednesday, the parliamentary session discussed bills on exemption of the customs tax, excise tax and VAT. A majority agreed that they should be discussed by plenary meeting. It has been projected that 320-350 cars will serve some 3,500-4,000 high level officials, delegates and journalists during the 11th ASEM Summit which will run here this July 15-16. The government has considered as necessity to tackle a financing for providing the vehicles with investments and support from the private sector. The cars, small-sized buses, special vehicles and techniques for the Summit will be used without charges, and their importers-companies will be freed from customs tax, excise tax and VAT. The bills reflects types of the vehicles, units and the companies as well. MOSCOW, January 27. /TASS/. The Federation Council, the upper house of Russia's parliament, has ratified an inter-governmental agreement on settling Mongolia's financial obligations to Russia. As of December 2010, Mongolia's unsettled financial obligations to Russia totaled $174.2 million. The entire sum of these liabilities was overdue debt. Mongolia's debt obligations to Moscow emerged in the period until the mid-1990s and comprise debts on loans provided by the former Soviet Union to Mongolia to pay about 163.7 million convertible rubles to the charter capital of the Mongolian-Soviet joint venture Mongolsovtsvetmet, as well as a surplus of 10.5 million clearing US dollars in favor of Russia under clearing accounts opened by Vnesheconombank with the State Bank of Mongolia. "As a result of bilateral negotiations held in July 2010, the sides managed to reach an agreement, under which Mongolia undertook to repay financial obligations worth 163.7 million convertible rubles and 10.5 million clearing US dollars with a lumpsum payment of $3.8 million," an explanatory note says. According to the note, the deal envisaged receiving funds from the debtor in freely convertible currency expressed in notional settlement units used under lending and trade operations of the former Soviet Union over the period of 20 years and now withdrawn from economic transactions of Russia and Mongolia. Russian Deputy Finance Minister Sergei Storchak said earlier that the write-off would involve 97% of Mongolia's debt. "It should be noted that the sum involves the debt denominated in the non-existing currency. Actually, the debtor always has a possibility to formulate the issue like this: no currency, no obligations. In this case, we agreed on recalculating the amount into the really existing monetary unit," he said. January 27 (news.mn) The President of Mongolia has been participating in the 46th World Economic Forum (WEF), which was held from 19th-23rd January in Davos. We, therefore, asked the director of the Multilateral Cooperation Authority at Ministry of Foreign Affairs, O.Gerelmaa, if she could explain about Mongolian participation in the WEF. -What issues were solved during the WEF? - On 19th January, the first day in Davos, the President held an official meeting with the founder of WEF, and discussed bi-lateral cooperation issues. For example, one topic which was discussed was about organizing an East Asian Forum to be held in Mongolia. -How did the President express Mongolia's position during the Forum? - The President expressed Mongolia's position during the special discussion meetings about world water and mining which were held on 21st January. On 22nd January, the President attended a discussion about the World Economy in 2016 with other world leaders. Also, during the WEF, the President met the Secretary General of the UN, the director of UN-Development Programm, the President of the International Monetary Fund, the President of World Bank and the President of Red Cross Society. Furthermore, the President had held discussions with the Presidents of Switzerland, Germany, Lithuania, Azerbaijan and Estonia. In addition a Mongolian culture event entitled "Mongolian Night" was held on 22nd January. January 26 (Budapest Business Journal) National Economy Minister Mihály Varga and Minister of Foreign Affairs and Trade Péter Szijjártó held talks with their Mongolian counterparts on Tuesday as part of a three-day official visit by Prime Minister Viktor Orbán to Mongolia. Varga discussed Hungarian-Mongolian economic ties with Mongolian Industry Minister Dondogdorj Erdenebat and Finance Minister Bayarbaatar Bolor. The parties agreed there is serious potential in bilateral economic ties, but the volume of trade is still significantly below its maximum capacity. According to the Hungarian National Economy Ministry (NGM) there are good opportunities for cooperation in the fields of food industry, the automotive industry, the construction sector, in infrastructural development projects, in the renewable energy sector and the mining sector. Following his meeting with Mongoliaʼs Minister of Foreign Affairs Lundeg Purevsuren in Ulaanbaatar, Szijjártó said Mongolia could help the European Union develop a "pragmatic cooperation" with Russia. The United States, China and the Arab nations have become very active in the world economy, so Europe and Russia should form a united front. However, in view of the current global political environment, namely the Ukrainian crisis, this is not so straightforward, Szijjártó said. Szijjártó noted that Mongolia concluded a partnership agreement with the European Union and it was holding talks on a similar agreements with the Eurasian Economic Union and will host the Asia-Europe Summit Meeting (ASEM) in July. January 27 (POST Online Media) Péter Szijjártó highlighted the $25 million agreement that enables Hungarian companies to modernise the country's largest agro-pharmaceutical factory, which was also originally built by Hungarian companies decades ago and produces vaccines for the country's 60 million livestock. "We see this investment as a gate through the large Mongolian market, which means opportunity to vaccinate, process and export all Mongolian livestock, and which may result in further construction and animal health-related market opportunities for Hungarian enterprises." The Minister also talked about the $10 million contract signed by the Hungarian Banknote Printing Company, within the framework of which the company will manufacture Mongolian electronic passports and which is a further opportunity for a Hungarian company to establish a foothold on a significant market. With reference to his meeting with Mongolian Foreign Minister Purevsuren Lundeg, Mr. Szijjártó explained that the main topics of discussion were issues of international politics, and the Hungarian standpoint according to which Europe will lose a lot in the long term if it is unable to develop a pragmatic cooperation with Europe is well known. "This I something in which Mongolia can provide major assistance," he said. Ulaanbaatar, January 27 (MONTSAME) Mongolia's Minister of Environment, Green Development and Tourism N.Battsereg MP Tuesday held talks with Mr Miklos Sesztak, the Hungarian Minister of National Development. They discussed ways of collaborating in the biggest projects on renewable energy, water management and tourism, and concurred to scrutinize these matters at a regular meeting of the intergovernmental commission. Battsereg said his Ministry urgently needs a technological support from highly developed countries, for "we should produce energy from renewable sources and reduce greenhouse gas". Mongolia could also cooperate with Hungary in augmenting biomass, in reducing desertification and increasing forest areas, Mr Battsereg said. Another way of working together may be an implementation of a 2.5 million US dollar worth project on creating a complex network of monitoring underground and surface water near basin of the Kherlen River, he added. After this, Mr Battsereg officially invited the Hungarian Minister to the High-Level Tourism Ministerial Summit of 33 countries along Eurasian Silk Road as well as to the first forum of nomadic tourism, which are scheduled this October 2016 in Ulaanbaatar. In response, Mr Sesztak thanked him for the meeting and said the two Ministries can cooperate in eco-energy sector, Hungary is experienced in the renewable energy sphere. He accepted the proposal of the Mongolian Minister and said again that a possibility exists to cooperate in sectors of solar energy, biomass and underground heat. Ulaanbaatar, January 27 (MONTSAME) The Ambassador Extraordinary and Plenipotentiary of Mongolia to the United Kingdom N.Tulga Tuesday paid a courtesy call on Baroness D'Souza, the Lord Speaker or Speaker of the House of Lords in the UK parliament. The two dignitaries shared views on the Mongolia-Britain relations and cooperation including the inter-parliamentary ties. The Ambassador passed her an invitation from Mongolia's Speaker to the 9th Asia-Europe Parliamentary Partnership (ASEP9) which will run this April 21-22 in Ulaanbaatar. January 27 (UB Post) The international Effects of Air Pollution on Children's Health conference took place in Ulaanbaatar to host discussions on solutions and methods to decrease the negative effects of air pollution on infant and children's health. The conference introduced the participants to the damage that air pollution imposes on infants and children, and speakers presented data from scientific studies concerning its effects on the respiratory system and children's susceptibility to pneumonia. The main aim of the conference was to bring about guidance to solve issues related to air pollution based on scientific findings, and to serve as a call for action. The conference aimed to inform the public and decision makers about ways to protect their health and methods to decrease the negative effects of household air pollution. "Parliament approved the Law on Air, Law on Air Pollution Fees, and a law on decreasing air pollution in Ulaanbaatar in 2012 to prevent air pollution, to monitor and decrease the amount of pollutants in the air, and to impose fees on those who significantly contribute to air pollution. "It's important to bring about efficient, fact-based guidance; a solution that clarifies the connection and roles of multiple disciplines in decreasing the negative effects of air pollution. We will support implementing guidance and solutions at all levels," said Ts.Buyantogtoo. The conference discussions were divided into four topics, including Air pollution in Mongolia: Reality and international experience; From facts to activities – Effects of air pollution on children's health, ways to decrease it; Effects of air pollution on the health of children and infants, ways to protect health; and Next step – Creating guidance to decrease effects of air pollution on children. Member of Parliament S.Oyun spoke at the session on air pollution in Mongolia and international experiences. "Ulaanbaatar is the coldest capital in the world, reaching -40 degrees Celsius in the winter. During these times, air quality plummets, with average levels of fine particulate matter reaching 15 times what is considered healthy by the World Health Organization (WHO) guidelines. "Actions against air pollution slowed down when the National Committee for Reducing Air Pollution was disbanded in 2013 and the Clean Air Fund was liquidated in 2015, and their operations were transferred to the Ministry of Environment, Green Development and Tourism. Without losing momentum, we should advance and accelerate activities in all possible ways. "So, we have to recreate the National Committee for Reducing Air Pollution, allocate money to fight air pollution, and continue our cooperation with international organizations," said S.Oyun. The MP also noted that it is essential to improve infrastructure in the ger districts, provide their residents with apartments, and solve construction issues. "According to studies by the WHO and the United Nations Environmental Programme, over seven million die from illnesses related to ambient and indoor air pollution. The numbers have doubled in recent years, showing the significance of the problem worldwide," she said. During the conference, Ryan Allen from Canada's Simon Fraser University presented the results of his study on the effects of Ulaanbaatar's smoke on infants in the womb and pregnant women. The study involved 540 pregnant women living in Sukhbaatar District. "Pregnant women who used devices to decrease the effects of air pollution gave birth to babies that were 0.4 centimeters longer and 80 grams heavier than the babies of women who didn't use any methods to decrease the effects of air pollution. You can see that air pollution is negatively affecting the development and growth of infants in the womb. If we don't decrease the levels of air pollution in Ulaanbaatar, it will become even more hazardous to the health of fetuses," said Allen. The scientist will continue his study until 2020, to see and follow the effects of air pollution on the respiratory system, the nervous system, and the logical development of his study participants until they reach the age of four. Ryan Allen is known for conducting a 2011 study which revealed that one in 10 deaths in Ulaanbaatar were attributable to air pollution. "Fresh Air-Healthy Future" exhibition and competition was presented as a part of the conference. It consisted of essays and paintings by secondary school students. B.Azjargal, a fourth grader at Orchin Secondary School, won the competition in the elementary school student category. "Ulaanbaatar has so much smoke that sometimes I can't see my surroundings, or even the road in front of me. I'm sometimes scared that I might get hit by a car because I can't see [through the smoke]," she said. Her painting illustrated air pollution as a monster. ULAANBAATAR, MONGOLIA, January — The Asian Development Bank (ADB) and the Government of Mongolia today signed three grant agreements totaling $7 million for projects to benefit the environment and livelihoods at Khuvsgul Lake National Park in northern Mongolia, upgrade school dormitories in Mongolia's western region, and improve affordable housing in Ulaanbaatar, the national capital. The three grants are funded by ADB's Japan Fund for Poverty Reduction (JFPR), which over the past 16 years has supported 42 projects in Mongolia dealing with poverty alleviation, livelihoods, and the environment. Signing for the Government of Mongolia was the Minister of Finance B. Bolor, while ADB Country Director Robert Schoellhammer signed on behalf of ADB. The event was witnessed by Mr. Battsereg, Minister for Environment, Green Development and Tourism; Mr. Gantumur, Minister for Education, Culture and Science; Mr. Enkh-Amgalan, Member of Parliament; and Vice Mayor for Ulaanbaatar, Mr. Ochirbat. Mr. Shimizu, Ambassador Extraordinary and Plenipotentiary of Japan to Mongolia also witnessed the event. "The Khuvsgul Lake project is ADB's first-ever tourism project in Mongolia—an undertaking that will help create jobs, develop sustainable community-based tourism, and protect the environment," said Mr. Schoellhammer. "The dormitory project will promote equal access to quality education, particularly for children from herder families, while the affordable housing project will provide green development for the fast-growing districts of Ulaanbaatar. These projects are aligned with ADB's broader strategy to diversify the economy, create jobs outside of the mining sector, and ensure opportunities for all, including people from disadvantaged backgrounds." Khuvsgul Lake National Park has long been considered one of the jewels in the crown of Mongolia's protected area estate. More than 1 million hectares of stunning snow-capped mountains and forested hillsides surround Khuvsgul Lake, which supports 70% of Mongolia's—and 1% of the world's—freshwater. Its pristine waters are vital to Mongolia, while the park's wilderness and biodiversity values are of global importance. Khuvsgul aimag (province) is increasingly becoming an international tourist destination. The Khuvsgul Lake project will focus on promoting sustainable tourism, community livelihoods, and environmental protection around the lake. Collaborative approaches will be implemented between the park authority, residents, and tour operators, to strengthen local tourism business and waste management. Mongolia's school dormitory system, meanwhile, was developed to ensure wider access to education, particularly for students from herder families. Many school dormitories were built in the 1970s and 1980s and require urgent rehabilitation. The western region supports the largest number of students staying in dormitories, of which 86% are from herder families. The dormitory project will establish nationally replicable models to improve dormitory buildings, facilities and childcare in three aimags, Gov-Altai, Uvs, and Zavkhan. Dormitory buildings and facilities for heating, sanitation and housing of students will be upgraded, staff training and management capacity will be strengthened, and a national strategy to improve the school dormitory environment will be developed. Improving the quality of life in Ulaanbaatar, especially in the ger (peri-urban) areas (where 60% of the 1.3 million people in Ulaanbaatar live) is one of the Government of Mongolia's main priorities. The affordable housing project will join many other initiatives of the government and the Municipality of Ulaanbaatar to provide better infrastructure and living environments for residents and to reduce air and soil pollution in the capital city. The project will promote the development of affordable housing stock through resource-efficient buildings and the use of renewable energy technology. It will integrate innovative planning for social cohesion and economic opportunities for the population. Financial and institutional arrangements will establish sustainable housing finance mechanisms and will combine public and private financing to ensure the sustainable redevelopment of the target areas. Established in May 2000, the Japan Fund for Poverty Reduction (JFPR) provides direct grant assistance to the poorest and most vulnerable groups in developing member countries of ADB, while fostering long-term social and economic development. January 26 (Daily Mail) This is the moment a staggering 35 children and three adults made their way out of one absolutely jam-packed jeep. The unbelievable footage, which was allegedly captured in Mongolia, has since gone viral with more than one million views online. Russian national TV channel NTV shared the clip, alongside Facebook group Mongol Bodol, and baffled viewers have since attempted to work out how that many people could fit in a single car. The astonishing footage, which is just shy of two-minutes in length, shows exactly how long it takes for everyone inside the vehicle to exit. After the jeep pulls up and three doors open, two of the adults crammed inside step out. Meanwhile two other adults wander towards the car in order to start removing the numerous children. Three of the adults then carry the children from the jeep one-by-one, who humorously form an orderly queue and head towards the building alongside the car. Once all the children have exited the vehicle the final adult then steps out of the now empty jeep. It is unclear exactly when the video was captured and people have suggested that the footage is more than ten years old. Some viewers have also questioned whether the footage was part of a stunt. While others have claimed that the adults were dropping the children to school. Whatever the reason for the overload, it appears to have broken a number of safety laws. January 25 (Yeni Şafak) Turkey's official overseas development agency (TİKA) said that archaeologists have unearthed fingerprints belonging to Turks in the east of Mongolia. The fingerprints, dating back 1,300 years, were found at the site of the earliest known example of Turkic writing found in Mongolia. The unique discovery was made during excavation work being carried out at Tonyukuk Monument, internationally known as Bain Tsokto. A large number of ancient tools were also discovered during the excavation. "One of the most striking findings is the one that we discovered in the no.11 trench. We uncovered fingerprints belonging to our ancestors dating back 1,300 years," said Ahmet Taşağıl, a senior academic from Yeditepe University, who led the excavation works in a report he submitted to TIKA. The scripts are named after the Orkhon Valley in Mongolia. The epigraphs, which date back to the early 8th century, were erected 430 kilometers from Ulan Bator, the Mongolian capital. The three massive slabs of stone inscribed in ancient Turkic script, erected on the steppes of eastern Mongolia, are called Orkhon monuments. Tonyukuk monument is one of the Orkhon Epigraphes, which are still considered masterpieces of Turkish language, literature and history. Ulaanbaatar, January 27 (MONTSAME) International master of sports Kh.Byambabaatar has come 6th in the men's 50m rifle prone contest at the Asia Olympic Qualifying Competition for Shooting which kicked off Tuesday in New Delhi of India. Among 41 shooters, Byambabaatar collected 621.7 points at the preliminary round and 120.2 points at the finals. The contest was led by a South Korean Kim Jonghyun with 206.3 points. Two Olympic quotas went to the contest's winner and the runner-up Vea Aree from Thailand. Other Mongolians N.Bayaraa and B.Bishrel IMSs took 15th and 23rd places in the same contest, respectively. PARK CITY, January 26 (KSL) — For 2,000 years, only the men of the Kazakh people in western Mongolia have hunted with eagles. But 13-year-old Aisholpan is not only the first girl to break the barrier, she's also the star of a Sundance Film Festival kid's film, "The Eagle Huntress." "I was 10 years old when I wanted to become an eagle huntress," said Aisholpan via her cousin, who interpreted for her and her parents. "We are very excited and very happy for everything that is happening like this," said Aisholpan's cousin. "And they (parents) are very proud of their daughter." Golden eagles can have a wingspan of seven-and-a-half feet and weigh between 15 to 20 pounds. Aisholpan's father said he recognized that she had a special gift with the birds. "When I saw her — how she was feeding the eagle, how she was carrying the eagle on her arm, and how she was looking after eagles — I thought that she might do this." Members of the Comanche Nation brought eagles from Oklahoma to Park City to help Aisholpan demonstrate her abilities. Members of the Comanche Nation breed the eagles in captivity. "They are a similar horse culture to the Comanche nation," said Bill Bover of the Comanche Nation Eagle Program. "The eagle is something that we've been connecting with for a long time. But to have them here, in a historic Comanche territory and to interact with them, is special for us." Aisholpan said her eagle back home in Mongolia, named White Wings, is a bit bigger than one of the eagles brought in from Oklahoma. As Aisholpan balances to release her bird, she is also balancing the traditions of her people with life in a modern world. Aisholpan believes the film has an important message. "Girls and boys are the same strong," said Aisholpan. "So, if the boy can do something, girls can do this as well." "The Eagle Huntress" has one more screening at Sundance at the Redstone Cinema this Saturday, and is recommended for children 12 years and older. January 27 (news.mn) Following a decision by the Minister of Education Culture and Science L.Gantumur, the "Mongolian Song to the World" competition is going to be aired in four stages. The purpose of the competition is to sing modern Mongolian pop songs in a foreign language, primarily English, and to promote Mongolian songs. "Doly Production", which belongs to the composer and Mongolian Honorary Artist B.Dolgion, is working as the co-organizer. The Ministry of Education Culture and Science has provided information about the competition. During a press conference, Minister Gantumur said: "We are going through hard economic times; the frequent economic crises are a result of the fact that Mongolia is almost totally dependent on mining. The only way to earn dollars is by mining. Many economic measures need to be taken to make Mongolia a more stable country. One of these ways needs to be art and culture. Here we are opening the gate to promoted "ready cultural exports" to the world, not just the domestic market". The competition will be aired from 29th January on several TV networks, namely: MN25, UBS Music, Star TV, Royal TV, 11 channel, World TV, SCH TV, and Parliament TV. The Honorary Artist B.Dashdondog, the composer and Leading Artist B.Angirmaa and the singer K.Nominjin will be the permanent team of judges.